Transifex's Zendesk integration is only available on the Growth plan and up. Additionally, you’ll need to be on Zendesk’s Guide Professional plan with Support Professional or Enterprise, as only those plans support multilingual content. 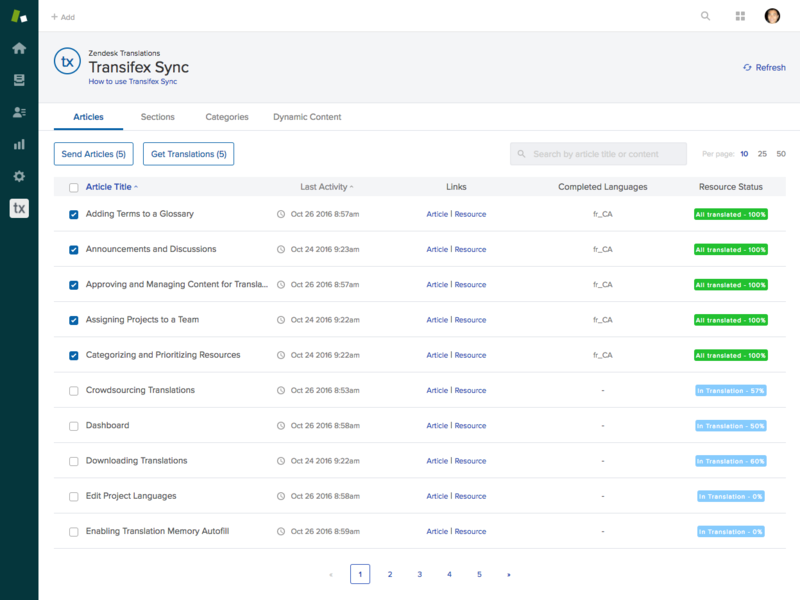 Before you can translate your Zendesk Help Center, you'll first need a project in Transifex for storing your Zendesk content and translations. To create a project, head to your Transifex Dashboard and click Create new project. Then follow the steps on the page to create your project. Choose File-based Project as your project type. Select source and target languages that are supported by Zendesk (see the third column of the table for the locale codes). Head to your Zendesk agent (the URL looks something like this: https://yourcompany.zendesk.com/agent/). Click on the Gear icon in the left menu to go to the Admin area. Under APPS, click on Marketplace. In the search box, type Transifex. Click on the Transifex app icon. Enter your Transifex credentials. We recommend using an API token, which you can generate from the user settings page. Once you have your API token, type api into the Transifex Username field and paste your API token into the Transifex Password field. Alternatively, you can use your Transifex username and password, though if you do this, be sure to input your Transifex username, not the email address associated with your account. Enter the URL for Transifex project you created earlier. The URL should look something like https://www.transifex.com/company/zendesk-help-center/. Be sure to include the https:// at the beginning and that there's no /dashboard/ at the end. Hit Install to finish the installation process. By default, your Zendesk Help Center only supports one language. You have to configure it to support additional languages. There are two places you have to do this: the Support Agent, and the Help Center. From your Zendesk Agent, click on the Gear icon to go back to the Admin area. Under SETTINGS, select Account, then click on the Localization tab. Set your default language from the dropdown. This should be the same as the source language you set for your project in Transifex. Click Additional languages and select the languages you want to offer your Help Center in. They should match the target languages you chose when you created your project earlier. From the top menu bar of the Agent, click on the windows/grid icon on the right. Then click on Guide. Click on Guide admin in the top menu bar. Click on the Gear icon in the left menu to go to the Settings. Scroll down to the Additional languages section of the page and select the same set of languages as before. Hit Update at the top of the page to save your settings. Now that you’ve set up a project and enabled multilingual support in your Help Center, you’re ready to start using Transifex Sync! Navigate back to your Zendesk Agent and click the Tx icon in the sidebar to enter Transifex Sync. There, you’ll see content from your articles, sections, categories, and dynamic content separated into individual tabs. For any translated article to be viewable in your Help Center, the name of the section and category it belongs to must be translated as well. You can learn more about this requirement in this Zendesk article. Use the checkboxes to select the articles you want to send to Transifex. Click the Send content button. Each article you upload will be added to Transifex as an individual HTML file (resource). You can quickly jump right to that article in Transifex by clicking on the Resource link in the Transifex Sync app. If you have trouble seeing the list of dynamic content and pushing it to Transifex, make sure your user role (if you're not an Administrator) has permission to access dynamic content in Zendesk. You can check whether a role has access by going to the Zendesk Agent > Admin > Manage > People > Roles and clicking the edit link next to a role. From there, make sure the checkbox next to Can access dynamic content is checked. Invite your translation agency or in-house team to work in Transifex using the Editor. Order translations from Transifex partners. The finished translations are delivered back to you inside Transifex. Crowdsource translations with your community. Machine translate using Google Translate or Bing Translator. In Transifex Sync, select the articles you want to get translations for. Click the Get Translations button. This saves translations from Transifex to Zendesk. You can get translations for an article as soon as it’s 100% translated in a language. 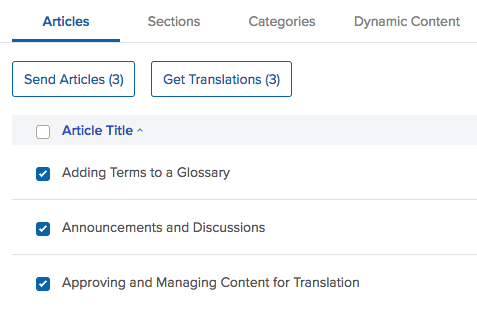 The Completed Translations column in Transifex Sync shows you which languages are 100% translated for a resource. The next time a user visits your Help Center, they’ll see a language switcher in the navigation menu. Whenever you update an article, you can follow the same steps as before to translate the changed content. The only difference is that when you click the “Send content” button, the existing HTML file in Transifex will be updated. New content is added to the file. Deleted content is removed. And unchanged content, along with their translations, will be preserved. You only have to translate the new content. More information about how Transifex handles file updates can be found here. If you have new Help Center content, but you’re not seeing it in Transifex Sync, click the Refresh link at the top right. This triggers a check in Zendesk and Transifex for new content. If you have multiple brands in Zendesk, you can use Transifex Sync to translate the help center of each brand. Setting up additional brands for translation works a little differently than that of setting up the first (primary) brand because the content from each brand will live in its own project in Transifex. Assuming you’ve followed the steps above to translate your primary brand, here’s how you can translate additional brands. There are two steps to this process. Follow the instructions here to generate a new Zendesk API token. Copy the token to your clipboard, you’ll need it later. From the Zendesk the Admin, go to the APPS section and click Manage. Click on the Transifex app icon and go to the App Configuration tab. Paste the API token you copied into the Zendesk API key field. Return to the Transifex Sync app. Click on the Select Brand dropdown in the right and hit Translate another brand. This will take you to a different page where you’ll create a new project in Transifex for the brand you want to translate. From the dropdown, select which brand you want to translate, then give the project a name (you can change this name in Transifex later). On this page, you’ll also see the languages the selected brand’s help center has been set up for. Hit Create Transifex project when done. You’ll be taken back to the article list view. From there, you can send content and get translations like you did before. If the brands you’re translating share similar content, we highly recommend sharing Translation Memory between those projects in Transifex. This will help you save on translation time and costs. If you want to update an article name in Zendesk, please keep in mind that it won’t automatically update the resource file name in Transifex. The name of a specific resource in Transifex can be modified via its settings in Transifex Web Interface; however, we recommend keeping the resource name in Transifex unmodified, to ensure that your articles in Zendesk are in sync with the corresponding resources in Transifex. It is recommended to have a TM autofill enabled, so that you don’t lose the translations. If you want to delete an article from Zendesk, please keep in mind that the corresponding resource in Transifex won't automatically be deleted. You will need to delete the resource from Transifex via either Transifex Web Interface or API if you are no longer interested in these translations.